The instructions given here and in all the data analysis chapters (14 to 22) will work with the SAS Learning Edition as well as with the SAS Enterprise Guide. For a point-and-click approach for performing principal components analysis and factor analysis, use the Analyze task within the SAS Learning Edition. The Multivariate>Factor Analysis tasks performs both Principal Components Analysis and Factor Analysis. The Multivariate>Principal Components tasks also performs Principal Components Analysis. The following are the detailed steps for running principal components analysis on the toothpaste attribute ratings (VI to V) using the data of Table 19.1. Select ANALYZE from the SAS Learning Edition menu bar. Click MULTIVARIATE and then FACTOR ANALYSIS. Move VI-V6 to the ANALYSIS variables task role . Click FACTORING METHOD and change the SMALLEST EIGENVALUE to 1. Click on ROTATION AND PLOTS and select ORTHOGONAL VARIMAX as the Rotation method and the SCREE PLOT under the PLOTS TO SHOW. Click on RESULTS and select EIGENVECTORS, FACTOR SCORING COEFFICIENTS under FACTOR RESULTS, and MEANS AND STANDARD DEVIATIONS of input columns, CORRELATION MATRIX of input columns and KAISER’S MEASURE OF SAMPLING ADEQUACY under RELATED STATISTICS. The procedure for running common factor analysis is similar, except that in step 5, select PRINCIPAL AXIS FACTORING as the ROTATION METHOD. 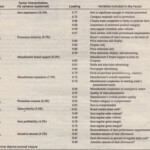 In the department store project, the respondents’ ratings of 21 lifestyle statements were factor analyzed to .determine the underlying lifestyle factors. Seven factors emerged: bank card versus store card preference, credit proneness, credit avoidance, leisure time orientation, credit card favorableness, credit convenience, and credit card cost consciousness. These factors, along with the demographic characteristics, were used to profile the segments formed as a result of clustering. Download the SPSS or SAS data file Sears Data 17 from the Web site for this book. for a description of this file. Can the 21 lifestyle statements be represented by a reduced set of factors? If so, what would be the interpretation of these factors? Conduct a principal components analysis-andsave the factor scores. Can the importance attached to the eight factors of the choice criteria be represented by a reduced set of factors? If so, what would be the interpretation of these factors? Conduct a principal components analysis. Factor analysis, also called exploratory factor analysis (EFA), is a class of procedures used for reducing and summarizing data. Each variable is expressed as a linear combination of the underlying factors. Likewise, the factors themselves can be expressed as linear combinations of the observed variables. 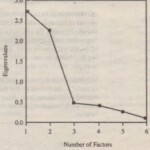 The factors are extracted in such a way that the first factor accounts for the highest variance in the data, the second the next highest, and so on. Additionally, it is possible to extract the factors so that the factors are uncorrelated, as in principal components analysis. 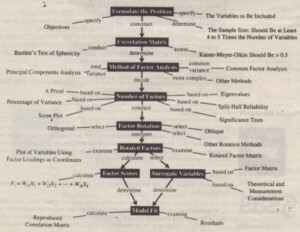 Figure 19.7 gives a concept map for factor analysis. In formulating the factor analysis problem, the variables to be included in the analysis should be specified based on past research, theory, and the judgment of the researcher. These variables should be measured on an interval or ratio scale. Factor analysis is based on a matrix of correlation between the variables. The appropriateness of the correlation matrix for factor analysis can be statistically tested. The two basic approaches to factor analysis are principal components analysis and common factor analysis. In principal components analysis, the total variance in the data is considered. Principal components analysis is recommended when the researcher’s primary concern is to determine the minimum number of factors that will account for maximum variance in the data for use in subsequent multivariate analysis. In common factor analysis, the factors are estimated based only on the common variance. This method is appropriate when the primary concern is to identify the underlying dimensions, and when the common variance is of interest. This method is also known as principal axis factoring. The number of factors that should be extracted can be determined a priori or based on eigenvalues, scree plots, percentage of variance, split-half reliability, or significance tests. 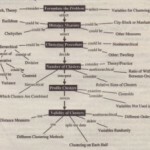 Although the initial or unrotated factor matrix indicates the relationship between the factors and individual variables, it seldom results in factors that can be interpreted, because the factors are correlated with many variables. Therefore, rotation is used to transform the factor matrix into a simpler one that is easier to interpret. The most commonly used method of rotation is the varimax procedure, which results in orthogonal factors. If the factors are highly correlated in the population, oblique rotation can be utilized. The rotated factor matrix forms the basis for interpreting the factors. Factor scores can be computed for each respondent. Alternatively, surrogate variables may be selected by examining the factor matrix and selecting for each factor a variable with the highest or near highest loading. The differences between the observed correlations and the reproduced correlations, as estimated from the factor matrix, can be examined to determine model fit.